Heartland Outdoors :: Non-Typical Hunter :: Who’s crying wolf now? This is the best post on the deer herd situation yet. I honestly don’t think the numbers being down have anything to do with over harvesting. I think a majority has to do with the EHD die offs. This illustration seems to be 1st season only. I fear with 2nd season figured in, it will look much worse. Which year/seasons does this map represent? The population has been on a downward trend since 2005. Clinton County’s total harvest, all seasons, has steadily declined every year from a high of 1702 in 2005/2006 to 1204 in 2012/2013. This represents a 29.2% decrease over the past 8 seasons. The fact of the matter is that most people don’t own large enough chunks of land to effectivly manage the herd. You can improve habitat on your land, let does walk etc..; however, if your neighbor shoots anything and everything that walks by, it pretty much negates your effort to help out the herd. Unfortunately the mentality of some hunters are that if the State has tags available it must be o.k. to keep filling them. If hunters were good at limiting their take of fish and game we wouldn’t need seasons and limits, but thats not going to happen. This is why the DNR has to limit the amount of tags it issues, period! I’d like to see how many nuisance tags the state also issued. Between that and my neighbors kill as many as you can mentality the hard work of establishing a quality hunting property for 10 years has been lost. Each year things get worse. The purge has to stop. I haven’t shot a doe for 3-4 years now. Fella’s I think we have a lot of different problems, over hunting, coyotes, but I believe there is a breeding problem also. Call me nuts, crazy, whatever, I was born and raised and still live in a small farming community with a lot of farmer friends, so this isn’t from someone that just hits the country to hunt,(which I have no problem with) but I think all these round up ready crops and round spray is doing somehting do the deer. As time goes on I hear more of cattle having problems, bulls going sterile, cows having trouble calving. I even had a farmer telling me about something called acidosis, hope I spelled it right. It is caused when a calf is fed to much round up corn and it start getting up there in weight, he explained it to me that like in the intestine area something starts eating the calf from the inside out till it finally eats through the skin and the insides come out. And think about this, in the fall when grain trucks are running to the elevators corn would be spilled at most intersections and most the fall and into the winter birds would feed on that grain. Do you really see that many birds feeding at that grain now? I don’t. Just another thing to think about. 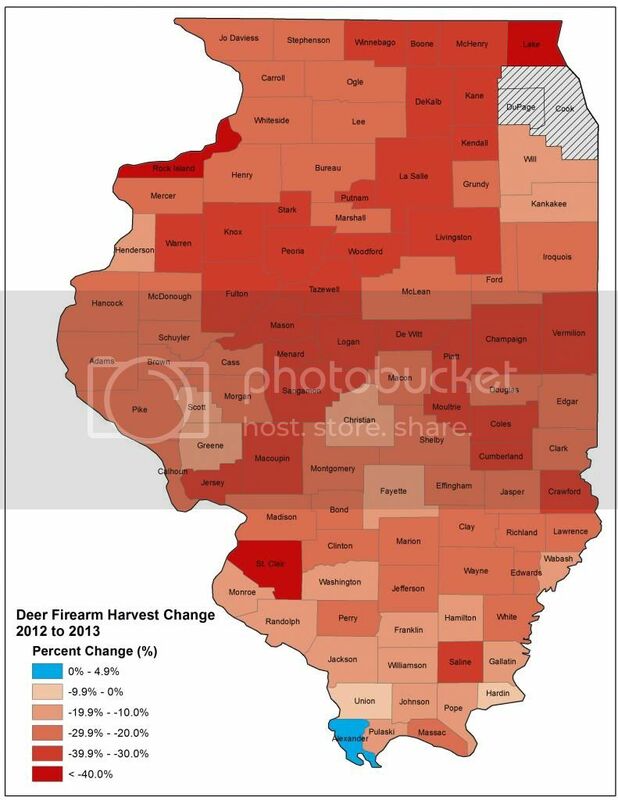 We need to call upon IL DNR Director Marc Miller to get him to immediately cancel the Late Winter Deer Season (LWS). Moving forward with LWS at this point is unnecessary, destructive, and completely irresponsible wildlife management. Mossyoak, I hate to be negative, but you must be stupid. Look at the numbers over the past several years…they have declined since 2005. I’m not saying they didn’t need to, but we had no EHD until last year. In addition to what the states records for harvest numbers, the current phone in system allows for thousands of deer to be harvested and never reported. I know several guys over the last 10+ years that have shot 10 or more does some years…you don’t think that has a lasting effect? If each doe only had one fawn, that’s 20 deer the next year. Likely as least will have twins, resulting in even bigger numbers. It’s up to us as hunters to stop pulling the trigger so many times. Full Draw- The EHD breakout of 2007 was detrimental in most of my areas. I’m pretty sure it was bad throughout much of the rest of the state too. That being said, the IDNR’s job is to manage our natural resources. When diseases break out, they need to recognize this, and then take action to correct the problem. Since they control tag sales, that is the tool they can use to prevent this sort of thing that has happened this year. There is no way they are going to cancel the late winter seasons. I don’t have exact numbers but I can only assume that the number of harvests is minimal compared to the rest of the seasons. illini, we dont need minimal harvest. We need proactive behavior from our dnr for the first time 20 years. But i do agree, there is no way they are going to cancel lws, they have the deer on the ropes where they have always wanted them and now is the time to pound them out. I seen someone post that they sold 630,000 tags? Shouldnt it be fraud when a tag doesnt represent a walking breathing deer? Miller won’t cancel the LWS He won’t get his bonus from the State Farm boys if he does. I see some outfitters going out of business. Unfortunately I also see some Taxidermists who deer primarily just deer as well. My taxidermist said as of the Sunday before shotgun season this is the worst year for taking in deer heads since he started doing it full time 25 years ago. Other friends of his were even worse and since they don’t do the variety he does didn’t know how many more years they could keep up if nothing changes. Of course the numbers being down are related to over harvesting. What kills me is when I hear guys say they aren’t seeing any deer around and they brag about killing 2-3 does in a season. EHD has just contributed to the situation. Not sure if the Round Up Ready crops impacts the deer, but I do think it devastated the pheasant population around here. I used to see pheasants all the time and I bet I haven’t seen one in 3 years. It seems like the coyote population is down too. Berlin and Tailhunter seem to be on the money with their appraisals. Things are much less active, much more sterile in the woods and streams these days. I think over-harvesting is an issue and I think there is something environmental as well. In my neck of the woods a trapper used to be able to catch muskrats in every ditch with a grassy bank. Not anymore. You don’t see as many. Of course, mother nature will do her own culling when populations peak out and I believe Blue Tongue was the tool she used this time on the deer….just like rabies and distemper do with furbearers. But over-harvesting along with it prevents a rebound. In the world of a trapper, there are no limits to virtually anything, with the exception of new arrivals like the otter and badger. But as a trapper, we all know that if we hit our territory too hard, there won’t be anything to harvest next year. Trappers have always had to do their own managing, and that is what is sorely needed here in Illinois with the deer herd. Too many folks out there for the killing and not the experience. It is like having someone come in and trap your territory after you have harvested ethically. You come back next year to nothing….or close to it. Got a lot of younger folks out there that need some mentoring. We have to be willing to step outside the box and do just that. Every little bit counts. For the past 4-5 years or so, the late season has been aroung 14-15,000, 8% of the total harvest. I agree about the Round up ready crops. My nephew and I were discussing this during the 1st shotgun season. The farm we hunt, originally his grandfathers, was loaded with pheasant and quail (at least for northern Illinois) in the 1990’s. I routinely kicked up 6-8 pheasants and a half 4-5 coveys of quail, hunting without a dog. Now, hunting with a pretty fair dog, it’s rare to see more than one pheasant and a small covey of quail. Yes, some habitat has been lost, but not that much. Monsanto is a powerful corportation. I don’t know if livestock farmers would be successful in limiting Round Up ready crops, if breeding problems were confirmed, but I’d bet that the loss of every deer, pheasant and quail in the US wouldn’t slow them down a bit. Just a question for all those that see a decrease in small game in your hunting areas. Are you also seeing any changes in predators? In my area I’ve seen 2-3 coyotes at a time in daylight running together , and have seen a larger increase in owls, red tailed hawks, and even regularly see bald eagles. Turkeys have vanished from the place I hunt. I’m seeing way fewer coyotes than I did in the past. In the `90’s, it was not unusual for me to see at least 4-6 during shotgun deer and another 2-3 in the spring turkey season. I haven’t seen a coyote during deer or turkey season for at least 6 years. I know they are still around as I hear them in the evenings. Owls, hawks and eagles have always been fairly thick in this area. Yes, I know they are getting some of the small game. It doesn’t appear that their density has increased too much. When I first became familiar with this area, in the spring there were young rabbits all over the roads and I’d see pheasants in the ditches. Now, it’s rare to see either. Trail cameras show that we’ve got an abundance or turkeys, at least in the one 80 acre patch where we placed the cameras. Some farms I hunt, I can understand the loss of upland game, as the habitat has decreased by 50% in the past 10-15 years. However, this one farm, I’d estimate a loss of less than 10%. I’d love to get an upland biologist to take a look at the farm and analyze what’s happening, but DNR is spread SO thin, and since I have zero say in land use or farming practices, it would be a waste of both of our time. While I can’t speak to the impact on small game, the impact of pesticides and herbicides to the animals exposed to them is well-documented all over the world. If you believe in a food chain (science), it makes sense. Speaking of science, EHD is impacted by drought, which is increased by climate change, which is directly impacted by humans. The trend here (besides management, which I totally agree is amiss) is that the way we treat where we live, farm, hunt, and fish is the root of all of this. If we claim to be conservationists and activists, the variables we need to change are all in these comments. Shooter49—excellent post regarding impacts that are truly longer term issues that must be dealt with now. I’ve been biding my time to see what kinds of ideas others have regarding the state of our deer herd and how we got to where we are. They all have some reasonable value and play a part, from overall deer herd mismanagement by IDNR (which I believe may be related to thoughts on disease management through lower deer numbers), to individual hunter restraint, politics, diseases, etc. . . Many of these things can be managed through a better understanding of ecology (study of how things interact in the natural world). There is no one simple solution or answer—it takes hunters, biologists, and everyday citizens to impact the overall ecology of our natural world in a positive way. Global climate change has the potential to negatively impact much more than just our deer herd. All of the opinions represented here have value, except those that include comments involving personal attacks. Our overall environmental state is headed in a bad direction, which impacts everyone on this Earth. We need more collaboration and less selfish concerns about what impacts us as individuals (I care about bow hunting only, deer only, pheasants only, quail only). Done correctly, and with sound ecological principles in mind, all of these species (including people) can live a healthier and happier life on this amazing place we call Earth.